A stormy day that stayed dry long enough for a mornings work on site. Whilst I struggled to do some important site survey work, I reluctantly allowed my mother to complete the excavation of the midden east of the chimney base rather than force her to help with the surveying. I am not good at surveying and need all the help I can get – but I also have a responsibility to keep other volunteers happy! I have both AD(H)D and Asperger syndrome which makes it hard for me to multi-task. I found managing the excavation of the trenches undertaken by our volunteers and recording what had been excavated too much to manage. 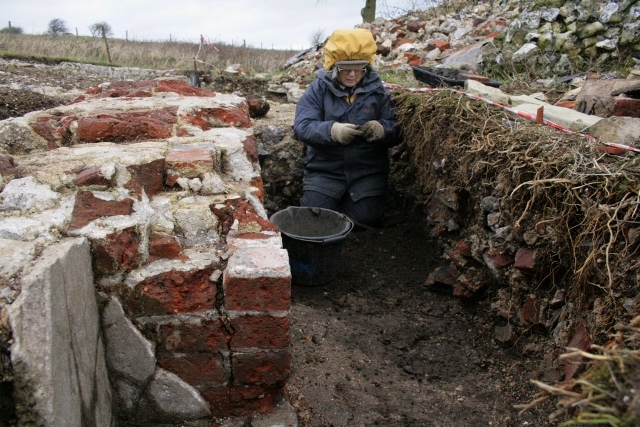 Understandably, despite encouragement, none of our volunteers were willing to give up digging for recording. So now, at least for me, the immediate priority is to catch up with formally recording the contexts which haven’t as yet been completed. Ceramic and glass finds from last week’s midden deposit were few (the most visible of the finds from this context had already been removed on our last dig). Needless to say, rusty nails as well as burnt and unburnt coal fragments remained plentiful. 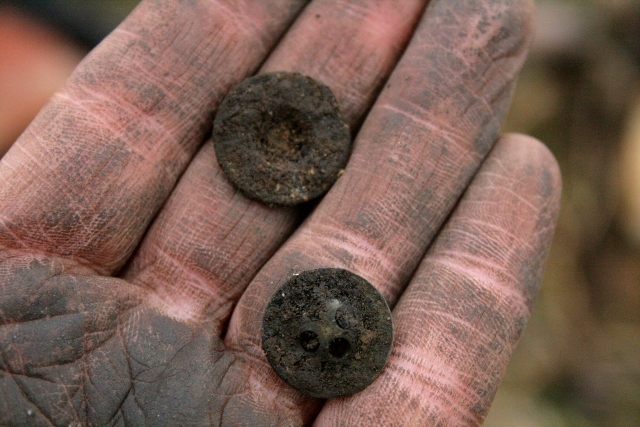 The best finds from this context were two medium/small metal buttons. Whilst we wait for a window in the weather guaranteed to be dry for the 3-d laser scan, there is still plenty to do. We would love you to join us – either for a site visit, or to help us with surveying and/or digging – no experience required! We meet at the car park near the junction of Bexhill Road and Falmer Road, just north of Woodingdean. *Please note* in future we will only be digging Sundays, from 10am – 3:30pm. Fridays will be dedicated to re-surveying the site. If the weather is too bad to dig we are still happy to give a quick tour for anyone interested. Please don’t hesitate to contact me for further info. Meanwhile, I am busy preparing for our first talk about the dig on Friday 10th January at the Holy Cross Church Hall, Woodingdean, at 7-30pm. Twelve historical objects, and key dig finds, will be used to illustrate the story of what we have discovered of the origins of Newmarket Farm, and the lives of those who lived there.